Resting Bull: Firpo’s statue and sarcophagus at La Recoleta. Boxers don’t know they’re born these days. When I was a lad, they got knocked out before breakfast and still fought another 90 rounds with a broken jaw and one arm tied behind their back. Take Luis Angel Firpo, for example. Nicknamed the “Wild Bull of the Pampas,” this Argentine heavyweight was knocked down nine times during his title fight with the legendary American champion Jack Dempsey in New York in 1923. In those days, not only was there was no limit on the number of knockdowns per round, you had to be beaten senseless before the ref would consider stopping the fight. Have a look at the fight in the vid below and you’ll also see that the neutral corner rule had not yet been introduced. Firpo has barely regained his feet and Dempsey is laying into him. Several accounts have stated that this was due to Firpo infuriating the “Manassa Mauler” out of the ring, but that doesn’t happen until the Argentine has been on the deck seven times himself, so this can be discounted. Perhaps it was in retaliation to an alleged first knockdown (with no count), that you can just about see right at the beginning of the round (Dempsey goes down on one knee briefly). There was also to be a long count in the Firpo fight. Following the seventh knockdown, Firpo unleashes a barrage of clubbing blows on his opponent. Quite how he managed to fight back, let alone produce this kind of attack after the pummeling he’d taken is anyone’s guess, but the blow that felled Dempsey was a real haymaker. Dempsey was knocked out of the ring, apparently smashing his head on a reporter’s typewriter in the process. The video is cut here (editorialising by the American media who couldn’t bear to see their man at sixes and sevens? ), but it is explained that Dempsey was given extra time to get back into the ring. Although, there have historically been claims that Firpo should have been awarded the fight, in reality, boxing’s rules already allowed 20 seconds for a fighter who had fallen through the ropes to reenter the ring. There are claims that the reporters who you can see at ringside assisted Dempsey, supporting him and shoving him back, but these seem pretty silly. Short of actually hauling him to his feet, how much could these stunned hacks have helped? 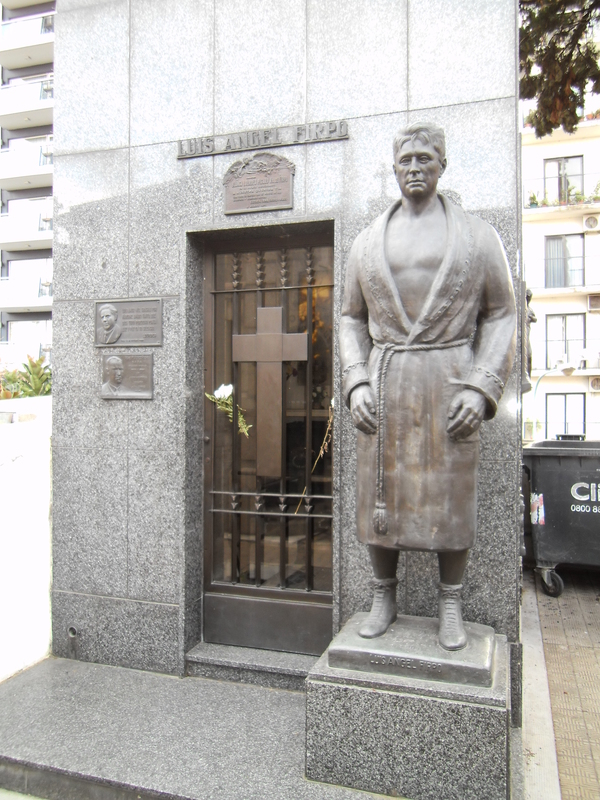 On Wednesday, I finally got to see Firpo’s tomb at La Recoleta Cemetery in Buenos Aires. My first attempt had been six-and-a-half years ago, but I’d turned up as they were closing up and couldn’t locate the grave in time. Recoleta is frequently cited as among the most beautiful cemeteries in the world and must be up there with Père Lachaise in Paris as the most visited. A map just inside the gates marks out the coordinates of all the graves but there don’t seem to be any signs among the labyrinth of tombs, so I’m not sure how the letters and numbers help. I’m sure there is a perfectly functioning system, but I just haven’t figured it out. Crowded around the map, tourists are inevitably looking for the location of the piece de resistance – Eva Peron’s tomb. I’ve never been too fussed about seeing it and, having failed again to find Firpo’s spot, based on the map, I asked a guard. He didn’t look that sure but a flat-capped local he was chatting to instantly started shadow boxing and shuffling when I uttered the name. “Straight ahead to the end. Under the pines,” he said. A third, old man with a scrunched-up newspaper face cackled as flat-cap continued his creaky Ali impression. It’s actually very easy to find Firpo’s tomb. Once you’re through the gates, it really is straight as a die, right at the back wall. I’m not sure when his statue went up but it looks relatively new. In fact, the whole thing looks like it’s had a facelift. The sarcophagus also contains the coffin of his wife, who passed away 11 years after Luis in 1971. Although relatively unheralded outside of South America, Firpo was for a time an iconic figure in Latin America, largely as a result of the Dempsey fight. The late boxing historian Bert Sugar reportedly cited the fight as the best of all time, and you can hear the commentator say it was the best heavyweight title fight ever at the end. While this is a definite exaggeration, the fight was certainly was a sensation at the time. By today’s standards, Firpo was a crude brawler. There’s no doubt he packed serious power, though, and the right that almost won him the title has been hailed as one the hardest ever thrown. Firpo was included in Ring Magazine’s list of the top hundred hardest punchers of all time. Far from a busy fighter in an era where hundred-plus-fight records were regularly compiled, Firpo ended his close-to-20-year career with unspectacular figures of 31-4 with two no contests. Reflecting his popularity throughout Latin America at the height of his career, his name lives on through Salvadoran footy team Club Deportivo Luis Ángel Firpo, which was established in the year of his most famous fight. This and the last writing are my bread and butter. Nice stuff and happy for ya mate. Keep it coming! I enjoyed this piece, too. My toast and jam. I was going to suggest a visit to Borges’ grave as well, but I’ve learned he was buried outside of Buenos Aires, in Switzerland. The so-called Aesthete´s last blog post ..SHOWTIME | NO SAW-TOOTH HANGERS EVER! Yup … I looked into that the first time i went … Glad you liked.